I couldn’t resist that big blowsy cauliflower at the farmer’s market. It made no sense to cart it home without a plan, since I was about to go on the road for the week. But there it was on the kitchen counter in all its glory, along with thick-walled red peppers from my garden and the season’s first carrots from our CSA. Giardiniera? That would be perfect if I didn’t already have a refrigerator full of all sorts of vegetables being pickled. So I decided to make a version of that pickled combination and can a few jars for the pantry. The recipe comes from the magazine Fine Cooking. While it uses a standard combination of vinegar, water and salt as a base, what I found interesting was the slightly Indian combination of toasted coriander, brown mustard and cumin seeds, ground turmeric and chunks of fresh ginger and hot red pepper. After curing for about a week, the pickled medley was tangy, slightly spicy and very flavorful. It will be great as an impromptu antipasto over the holidays or a sparky counterpart to rich meats or scalloped potatoes. 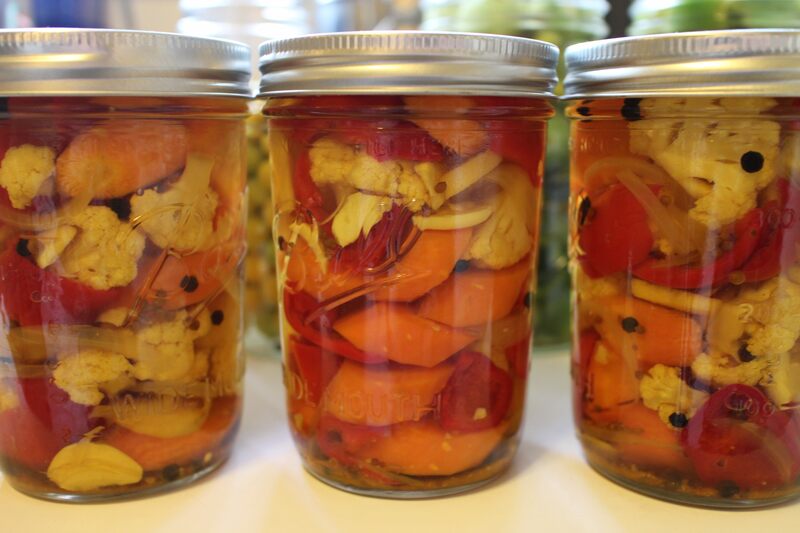 If you are canning the pickles, prepare 4 one-pint jars for water bath canning. Have all ingredients prepared and ready to go. 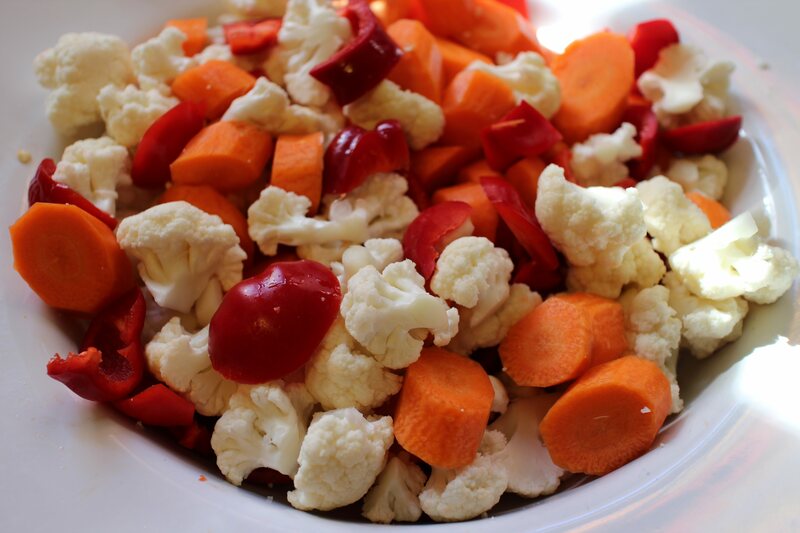 Place equal amounts of cauliflower, carrots and red peppers in the hot jars. 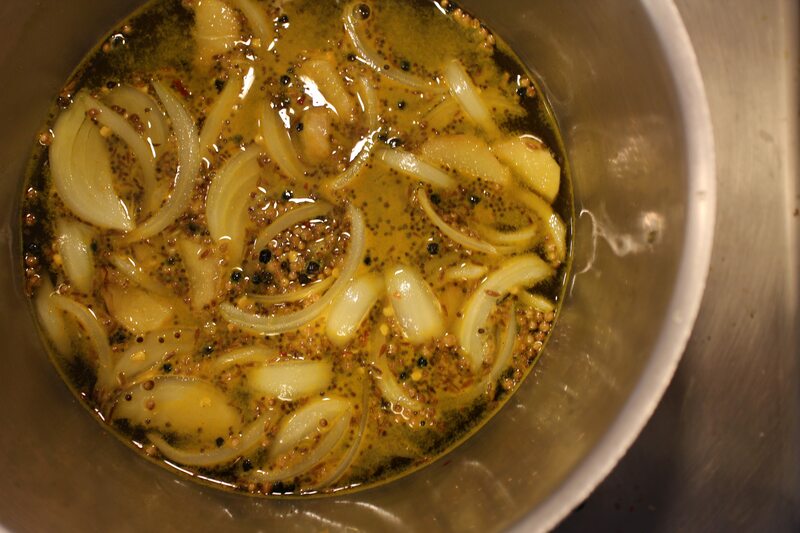 In a medium saucepan over medium heat, lightly toast the coriander, mustard and cumin seeds until aromatic, 1-2 minutes. Add the rest of the ingredients, increase the heat and bring to a boil. Pour over the vegetables, making sure to distribute the ingredients evenly among the jars. Leave ½-inch of head space. Insert a chopstick into each jar to release any air bubbles and wipe the rims clean. Top with warm, sterilized two-part canning lids. Process in a water bath for 10 minutes after the water returns to a boil. Turn off heat, remove canner lid and let sit for 5 minutes before removing to the counter to sit undisturbed until cool. Set aside for at least a week to cure before eating, whether you’ve canned them or not (store in refrigerator if not canned).